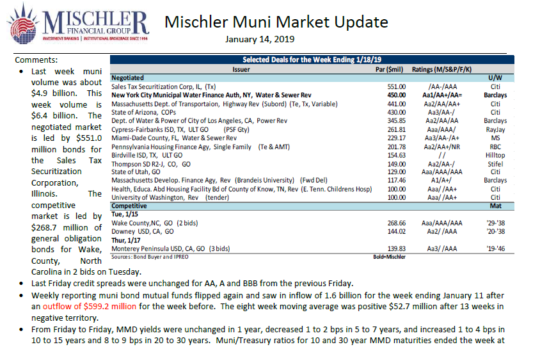 Mischler Muni Market Update; New Municipal Bond Offerings Scheduled for Week of January 14, 2019- Mischler Muni Market Outlook provides public finance investment managers, institutional investors focused on municipal debt, and municipal bond market participants with a summary of the prior week’s municipal bond market activity, including credit spreads, money flows, and a look at pending municipal finance offerings tentatively scheduled for the most current week. Last week muni volume new issuance was about $4.9 billion. This week’s municipal bond new issue volume is expected to be $6.4 billion. The negotiated market is led by $551.0 million bonds for the Sales Tax Securitization Corporation, Illinois. The competitive market is led by $268.7 million of general obligation bonds for Wake, County, North Carolina in 2 bids on Tuesday. During first half of 2018, and full years 2017 and 2016 alone, minority broker-dealer Mischler Financial Group Inc. underwriting roles (for which MFG has led, co-managed and/or served as selling group member) have included more than $625 Billion (notional value) in new debt and preferred shares issued by Fortune corporations, as well as debt issued by various municipalities and US Government agencies. 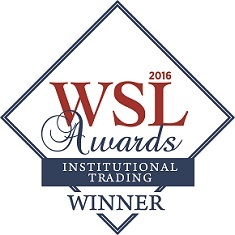 Mischler Financial Group is the securities industry’s oldest minority broker-dealer owned and operated by Service-Disabled Veterans.